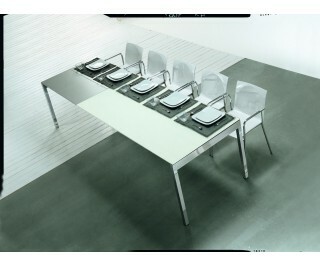 Extendable table with aluminium frame; mm 40 x 40 square legs, 2 of them are provided with wheels to help the extension of the table. Two grey laminate extensions, (cm 50 long each) placed under the top, must be rotated by hand to be finally opened like a book. Two ways of extension are available. Frame is availale in the following finishes: aluminium, chromium-plated or lacquered finish. In the same colour of the top. The tops are in tempered and lacquered crystal glass (thickness mm 12) available in many different colours, either in shining or satin finish anti-finger print.